‘Dikkulu Choodaku Ramayya’ is a rom-com when both father and son fall in love with the same girl. Gopala Krishna (Ajay) gets married at an early age and had two sons. In his late 30’s he starts realizing it’s the perfect time to turn a new leaf and start over. At the same time, Krishna meets with Sameeta (Sana Maqbool), a young independent girl, an aerobics teacher. In a short time, they turn out to be good friends. But things turn around, when Madhu (Naga Shourya) meets Sameeta. Father and son compete for the same women. Will Gopala marry Sameeta? Will Madhu make his father realize the truth? forms the rest of the storyline. Ajay tries hard, does well in most scenes. A much matured performance, but isn’t consistent in emotional sequences. Naga Shourya is decent, although some of his expressions make you cringe on your seats. Sana Maqbool is okay in her debut movie. RJ Kajal’s dubbing suited her character. Indraja does well too, nice to see her back. The rest including Ali, Posani Krishna Murali and Pavani Reddy in short roles do well. Bhramaji has limited scope, but did well. Even his wife character (a TV serial artist) is good in a small role. The story deals with Father and son falling in love with same girl and how the son saves his girlfriend from his dad and takes care of his mother. The story of the film is fine. From the brief story above, it all seems very predictable, doesn’t it? No twists or turns, no suspense, just old fashioned tear jerker, wherein the hero wins against all odds. The first half is a complete drag the pace is extremely slow and the film is completely dependent on Ajay. Pace in the second half is extremely slow, worth a dozen yawns minimum. The director could have conveyed the same, with more impact in less than 2 hours. The climax is poorly written and dreadfully executed. Naga Shourya’s final emotional burst was as over the top as Sachin in Nee Jathaga Nenundali. Director has taken few inspirations from American Beauty, The Love Boat and Damage. Music by M M Keeravani is top notch. BGM totally elevate the scenes. Cinematography Rajasekhar is neat. The dialogues to a certain extent are very natural. Editor should have used his scissors well for the second half of the film. Production values by Varahi Chalana Chitra are grand. So, in all Dikkulu Chuddaku Ramayya can just be appreciated for decent kind of effort made by its first time director Trikoti. But talking about everything else, it goes well over the top, exploiting the same old theme of Family, Middle Life Crises and Realization for the nth time along with some erratic writing. 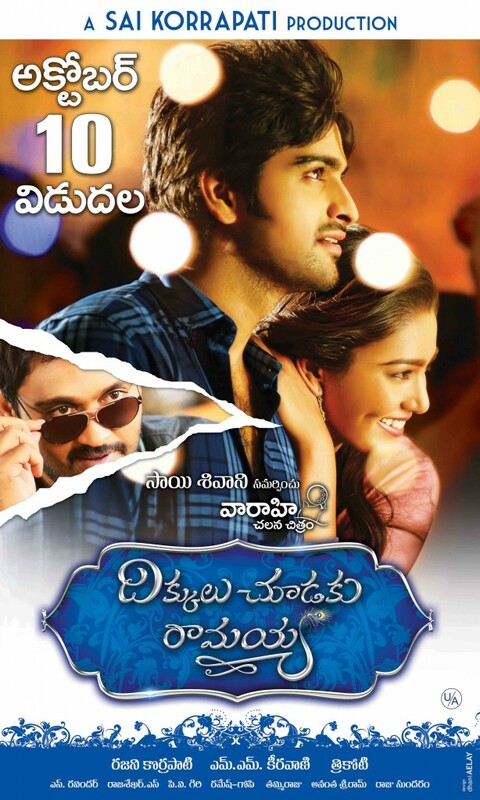 Dikkulu Chuddaku Ramayya has heart, a time-tested premise and some good performances. It tries hard to tow the formula, and yet it’s worth a watch if you can ignore the snail paced second half. Overall, Dikkulu Chuddaku Ramayya works to a certain extent, but terribly letdown by the poorly written script and executed second half.